Tell the next president: No more war! Tell the next president: No more war! 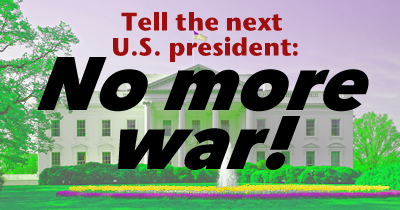 Tell the next president: No more war!
" Shining the light" on buildings and offices of these politicians and most definitely on Trump buildings is an inexpensive way to get a message out there. By taking action you agree that you may receive action alerts from RootsAction.org. We consider your contact information to be private and confidential. We will NOT disclose it to any other entity unless you specifically authorize us to do so. You can unsubscribe at the bottom of any email you receive from us. To add your organizational endorsement, click here.